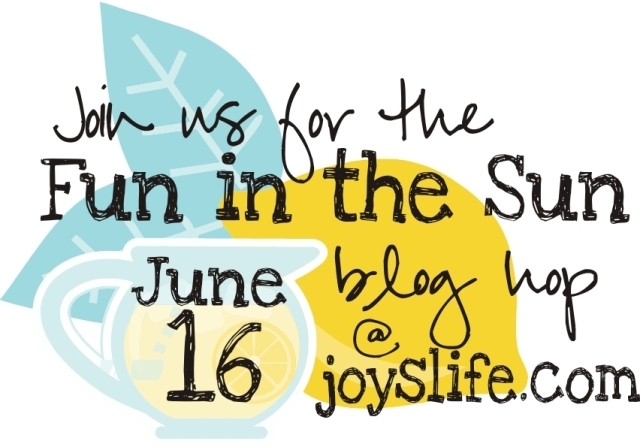 Welcome to the next step of the Joy's Life Fun in the Sun Blog hop! This month we are featuring Joy's brand new stamp set! Check it out - isn't it fabulous?! I got to work with the 'Wishing you blue skies' stamp. I knew right away what I wanted to do. I wanted to make a blue sky of course! I masked off the clouds and misted with some 'blue sky' glimmer mist. Then I thought it would be fun to add a sun, but that didn't work out so well. What can I say? Im just a simple gal. So I remade the card and kept it simple. I stamped the sentiment in black and voila! Done. Those spots on it that look like dust or dirt, are glitter from another project. I have a love-hate relationship with loose glitter and in this particular instance it went more towards the hate side, because I spilled the WHOLE BOTTLE all over my desk. Even after I cleaned it up, little flecks seem to be getting on everything! Here's the line up. You should have arrived here from Cyndy's blog and you are heading onto Lori's blog now. If you didn't get here from Cyndy's blog, you might want to head back to the beginning to make sure that you don't miss out on all the fun and prizes along the way! Beautiful paper for your card. Great sentiment. I love the simplicity of this card, plus it's my favorite color! What a cute card! 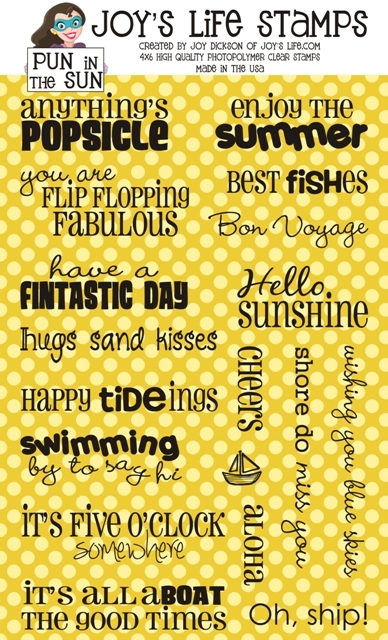 Thank you for being in the Pun in the Sun blog hop! What a cute card! I love the simplicity! this is so pretty! love the CAS look and the perfect matching sentiment! How cute is that. That scene just puts my mind at ease! Simple and sweet! I love it! love this clean fresh design Megan! great job using the masking technique!! What a fantastic card.. So simple and just perfect! What a super cute cloud card. Love those puffy looking clouds. Love glimmer mist. Great card. This is very cool!! So cute!! Great sentiment for the card. I also have a love/hate relationship with loose glitter. TFS! The simplicity of this card is beautiful and the sentiment is just perfect for it!! I love it! This is so simple it almost makes me laugh. Seems like lots of people think more is better, but you've proven that untrue! What a fun, clean and simple card! Perfect! I love the simplicity of this card. Thanks for sharing. Cute card!! And I totally understand the love/hate thing with glitter!! You'll be finding pieces from the bottle you spilled for weeks...eek! 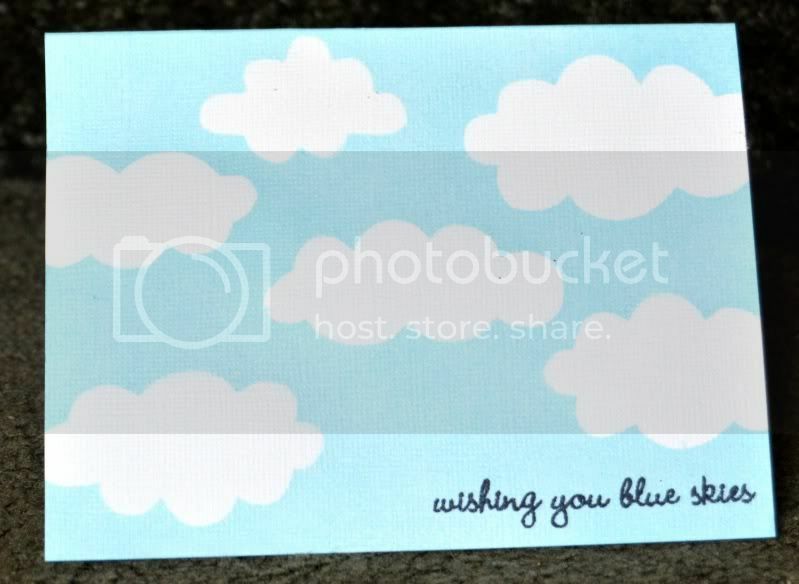 Love the blue sky and clouds...great card. Simple but sweet...love this technique!